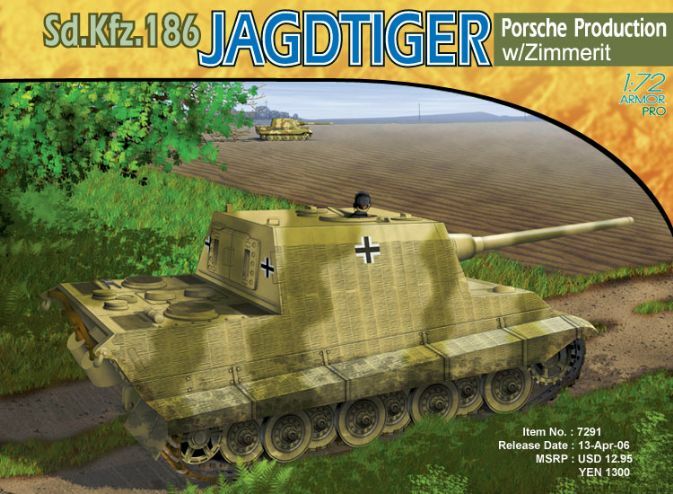 This new Jagdtiger Porsche version kit boasts a range of multi-media parts, including photo-etched components, and DS tracks for superior detail. Also included is an accurate coating of Zimmerit! An order was issued by the German leader in May 1942 for the development of a new self-propelled armored vehicle mounting a 128mm gun. The resulting mighty vehicle was known as the Jagdtiger, a massive behemoth that weighed around 70 tons. There were two differing types produced initially, according to whether a Henschel or Porsche chassis was employed. The Porsche chassis had eight road wheels each side instead of the nine on the Henschel.